Adding a whole new dimension to the iPad Pro in an incredibly precise way. When using iPad Pro, there may be moments when you want even greater precision. So Apple designed Apple Pencil to expand on the versatility of Multi-Touch. And while the technology inside is unlike anything Apple has previously engineered, picking up Apple Penvil for the first time feels instantly familiar. It lets you make any number of effects, right down to a single pixel, giving you more creative freedom than ever before. The lightning-fast responsiveness of Apple Penvil seperates it from other creative tools. That's because its latency has been reduced to an almost imperceptible level. Within its slender case are intricate and accurate pressure sensors, capable of measuring a range of forces. 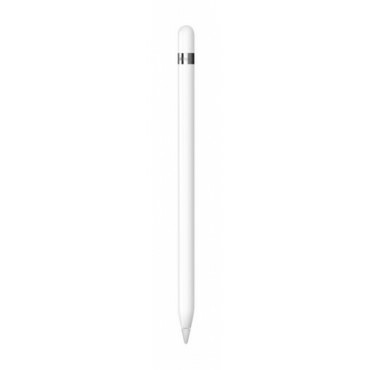 The carefully positioned sensor determines precisely how hard the tip of Apple Pencil is being pressed down. Press harder to draw thicker lines. Or use a gentle touch for wispy hairlines. The variety of creative effects is virtually limitless. Two tilt sensors in the tip of Apple Pencil calculate the exact orientation and angle of your hand. As you naturally write or draw, the relative positions of these sensors can be detected by the Multi-Touch display. So you can create shading effects simply by tilting Apple Pencil the way you would a charcoal or conventional pencil. Apple Pencil provides you with up to 12 hours worth of scribbling, sketching, annotating and editing. And if the battery runs out while using Apple Pencil, you can just charge it from your iPad Pro for 15 seconds and get 30 minutes of use.